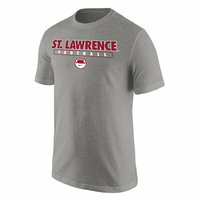 Classic short sleeve tee with ST. LAWRENCE arched across the chest. You'll want one in every color! 100% cotton; heather gray is 90% cotton, 10% poly; charcoal is 50% cotton, 50% poly. By Gear for Sports. Classic long sleeve tee with St. Lawrence University screened logo in red. Cotton/poly blend. By Champion. A classic favorite. 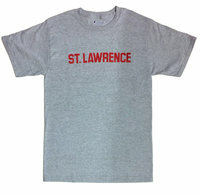 100% cotton tee with arched ST. LAWRENCE. By Champion. Long sleeve gray cotton blend hockey t-shirt. 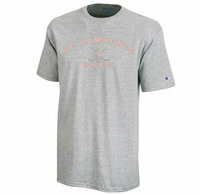 Gray short sleeve cotton blend hockey t-shirt with a weathered imprint. An all-time favorite. White short sleeve "invisible saint" hockey t-shirt. A cotton blend made by Champion.